My foolproof chocolate fudge is rich, creamy, and so decadent! And you won’t believe how easy it is to make! This is the perfect fudge recipe for Christmas! Happy Saturday! Sharing a personal favorite with you today: Easy Chocolate Fudge. This candy shop quality recipe is made in just one pan, always sets (no fudge soup here, thank you very much), and is loaded with rich chocolate flavor. 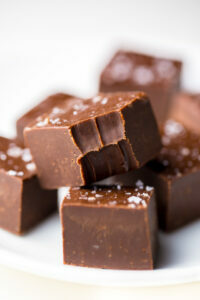 Ready to sink your teeth into this chocolate fudge recipe or what?! Use high-quality chocolate for this recipe. I used Ghirardelli semi-sweet chocolate, but Godiva, Lindt, Baker’s, Trader Joe’s Pound Plus, and Scharffen Berger are all great options. Just be sure you don’t use chocolate chips! Due to the sweetness of this recipe, I do not suggest using milk chocolate in place of the semi-sweet chocolate. For a less sweet version, try using a dark chocolate. Anything up to 70% cocoa will work fine. I love topping this foolproof chocolate fudge with flaky sea salt, but this is totally optional. You can leave the fudge plain, or top it with a handful of chopped walnuts, sprinkles, or chocolate chips. The fudge will need two hours to set, so be sure to plan ahead time wise. Easy Foolproof Fudge for the win! Hope you love this as much as we do. Lightly grease an 8 x 8-inch baking pan. Line the pan with parchment paper, allowing the excess paper to overhang the sides, set aside. In a large, heatproof bowl combine the sweetened condensed milk, vanilla extract, chocolate, and butter; set aside. Fill a saucepan with a little water (you want it about 1/4 full) and bring it to a boil. Reduce the heat to barely a simmer. Place your heatproof glass bowl holding your ingredients on top of the pot. Stir frequently, until the chocolate has melted and the mixture is completely smooth, about 8 minutes. Remove from heat. The mixture will be very thick. Using a sturdy spatula, scrape the fudge into the prepared pan and smooth the top. 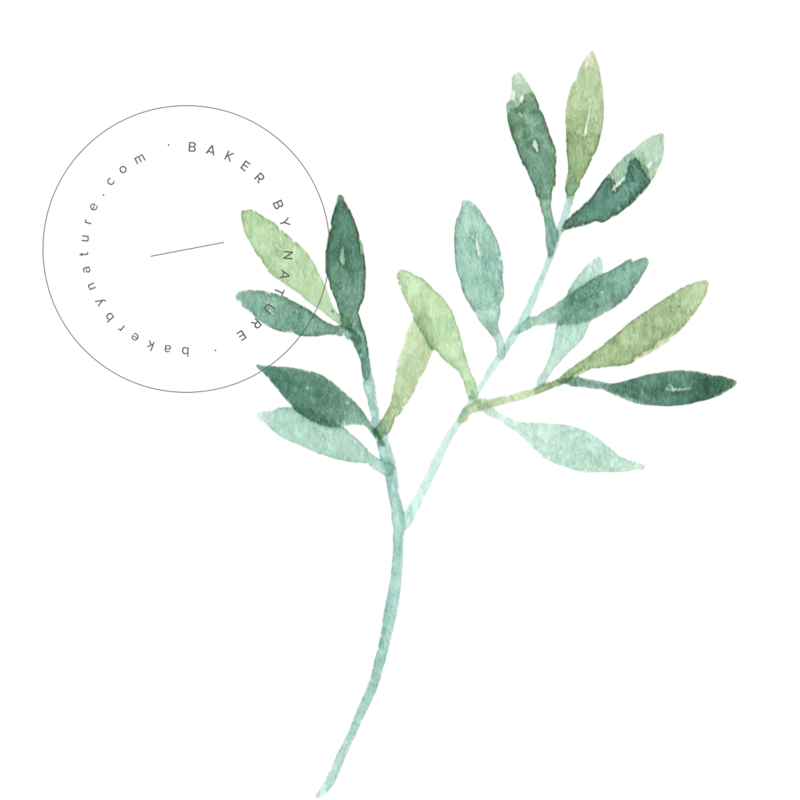 Sprinkle with sea salt, if using. Refrigerate for at least 2 hours. Gently run a butter knife around the edge of the pan to loosen the fudge. Remove the fudge and transfer it to a cutting board. Peel off parchment paper, then slice the fudge into small pieces. Serve at once or store in the refrigerator for up to 1 month. You may also freeze the fudge, in an airtight freezer safe container for up to two months. I love how easy this fudge is to make! I might have to go try some right now! Holy wow, two pounds of chocolate!!! That seems like a lot but it sounds good!! Hi Kimberly! This recipe calls for a little over a pound of chocolate, but definitely still a lot 😉 The large amount of chocolate helps it set into creamy, sliceable fudge. I hope you get a chance to try it out! How about Gharardelli chocolate chips? I find for best results chocolate bars work best for this recipe. Can I add some chopped walnuts for inside the fudge? About how much would I use? Thanks! Hi Jan! Yes, but I wouldn’t add more than 3/4 cup. Is it supposed to look oily? I have placed it in the fridge to set but i am not sure it wil turn out oke. I have used 63% chocolate. Love to hear wat you think. Thanks a lot, greetings from the Netherlands, Marjolein. Hi Marjolein! How did it turn out? Hi again, it turned out a bit grainy, not creamy at all. Maybe i should have melted it over a double boiler? Hi Marjolein. I’m so sorry your fudge didn’t turn out as it should. It sounds like your chocolate may have been over cooked… that’s the only reason I can think of that this fudge would be grainy and not creamy. I will add a note about a double boiler, just in case others have the same problem. YES-a dark chocolate version of this fudge is exactly what I need! Hello, this sounds like a great recipe and I will try it soon as my first fudge ever! How long and how do you store it? Can you make it ahead and freeze it? I read somewhere that you can substitute 1 cup cream and 1 cup sugar for a 14-oz can of sweetened condensed milk. Can you use salted butter in place of unsalted? I was about to make this and realized I only have salted butter. Oh. My. Goodness. I have been on the search for a good fudge recipe for the longest time. This recipe is SO delicious! I was a little nervous because my chocolate didn’t seem very creamy but in fear of over cooking it I threw it in the fridge with a lick and a promise and it came out with the perfect consistency. Thank you for sharing! Made this fudge yesterday. Simple to make and tastes delicious. ..Have made it to put in Christmas hampers. Looks awesome I have a bit of a language problem. Do you mean to place the mixture (in is bowl) into the saucepan with the hot water on the stove? Hi Irene. You’ll place the ingredients into a bowl, then place the bowl on top of the saucepan which contains the simmering water. Just tried this recipe, it’s in the fridge setting as I type. I had some trouble with the bowl over the saucepan! The recipe says it takes about 8 minutes to melt and become smooth but I was stirring for about 20 minutes and it still wasn’t melted all the way or smooth. (The water was at a simmer) So I just transferred it directly to a saucepan to get it to melt and it melted very quickly, but is it supposed to be so thick that it plops into the 8X8 in one piece? There was not a remnant of chocolate left in the saucepan! I tasted some of it, very thick, creamy, very good. Just nervous about when it comes out of the fridge! Is there a reason why you have to melt it in a bowl over a saucepan or double boiler and not directly in a saucepan? Hi Jules. The double boiler method ensures the chocolate doesn’t burn or become grainy. The mixture is VERY thick, so it sounds like you’re fudge will be perfect! Hi Cindy. The only reason the chocolate would be grainy is if it’s over cooked. The water shouldn’t be touching the bowl for the double boiler, and the water should be simmering, not rapidly boiling, that way there’s no way it burns. I’m sorry yours didn’t turn out. Let me know if I can help troubleshoot anything else for you! Happy holidays. Glad to see a recipe such as this that doesn’t call for chocolate chips. They are formulated differently than chocolate bars. The process should always be done in a double boiler, never directly on the burner or element. Water doesn’t even have to simmer, just below is safest. Chop the chocolate small and stir often. Overheating causes the mixture to be grainy and to separate. I usually go through about 100 lbs. of Callebaut chocolate at Christmas making bark and truffles and I’ve learned from my mistakes over the years. I finally got down to it today and it was fabulous and so simple ! Thank you Ashley ! Just made this yum but takes like I’m eating chocolate. How can you make fudge chewy?? You could try adding a little less chocolate, which will make the fudge softer. Fudge is typically more creamy and smooth than chewy. I tried the fudge, I have it in the freezer, I added fresh cherries and it hasn’t set. It’s been two hours was it the fresh cherries that it doesn’t set??? Hi Freddy. Adding fresh cherries will definitely change the texture of the fudge. By adding fresh fruit, you add moisture, which is probably why the fudge didn’t set. I would suggest using dried cherries next time. I made this and used only 4 chocolate bars (16oz) instead of 5 bars and it still came out good! Fudge was creamy and the recipe was very easy to make. I removed the bowl from heat as soon as the chocolate was melted and it was thick (only took about 5 minutes, but I’m at 4,000ft elevation). I think I prefer the taste of milk chocolate- maybe next time I’ll try half semi-sweet and half milk chocolate? I am just about to make your fudge for the second time. It was easy and soooo delicious, even my dairy free husband had to have one little piece. Now I have to make condensed milk from rice milk so that he can have some too. However, this time I am making some as gifts to take on a road trip my sister and I are taking to visit our elderly aunties. I knew right away that this fudge of yours would be my go to recipe. Thank you for it, very much. I made this recipe and followed it exactly. It turned out watery!!!! I’m beyond disappointed!! I definitely WON’T make this recipe ever again!!!! Hi Marica. I’m sorry you had trouble with this recipe. I’m not sure how you could have had watery fudge though… the recipe calls for 20 ounces of chocolate, butter, and sweetened condensed milk which all solidify when chilled. Please let me know if I can help you troubleshoot this recipe in anyway. dont blame bakerbynature. you obviously did something wrong!! If I wanted to make mint chocolate fudge with this recipe, I’m assuming I could just substitute 1/2 tsp of peppermint extract for the vanilla, right? Of course, you know what assuming does! LOL! How do I pack fudge to put it in gift boxes with cavities. Will it form vapour? 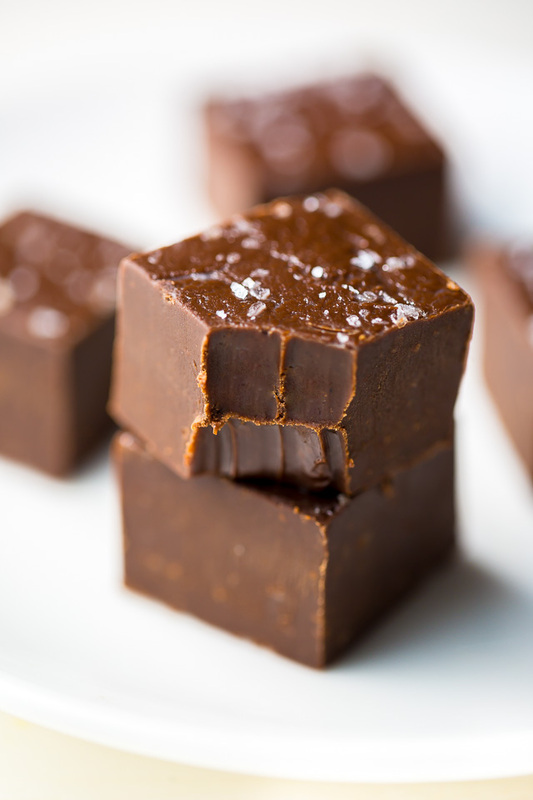 This fudge is so simple. His fudge is so delicious you can do so much with it in different flavors. There is no reason why you should not enjoy this recipe. It takes more time to sit then to make. OMGoodness. 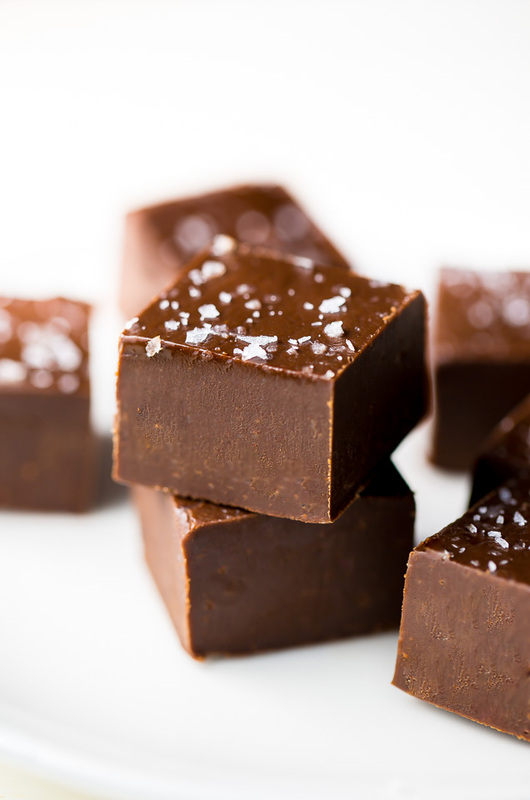 This fudge is easy and so delicious! I made a mistake and bought dark chocolate and my husband said to make that mistake again and again! Thank you! Do you have a peanut butter recipe that is just as easy? Will definitely be making this fudge again and again. Can I make this into a wreath shape.. like Rachael Ray’s “fudge wreath?” Her recipe is TOO sweet. Thank you so much for sharing the recipe! I made this, this past weekend with my mom and it came out great! 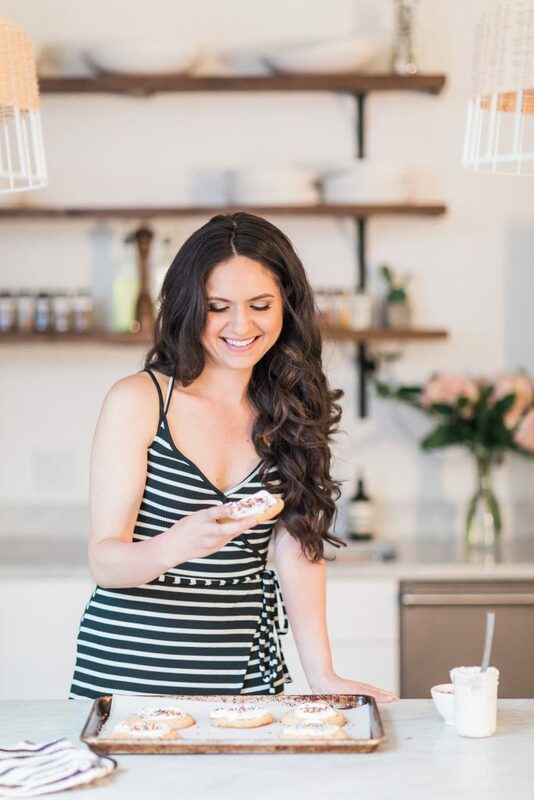 I wrote all about it on my blog and shared your recipe! I do not eat butter, can I replace it with something else? Thanks a lot for this awesome fudge. It is simple and yet delicious. I used dark chocolate Morde as that is all that is we get. I showed my niece the pictures she has loved them and I will be sending her some. Thanks once again. I am writing a blog post for Valentine and this is the what I am writing about. I don’t have sweetened condensed milk, can I do it also with non sweetened condensed milk? Can i use ganache for this recipe? Will it still taste good? Can you do it with coco powder if you don’t have chocolate bark? Yummy, I am going to ROCK that fudge recipe in my kitchen Right NOW! Thank u for sharing. any tips for cutting them . in the picture they are so perfectly cut. I made this. It was so easy and it’s so good. However my husband prefers hard set fudge. Would there be a way to modify this to make it set harder?